Eighty-year-old Bhagwati has acquired a new name in Shakir Ali (Gas Rahat) Chikitsalaya in old Bhopal. O gaswali, the nurse called out to her. Bhagwati had been admitted for eight days when Down To Earth met her. Her abdomen and legs were swollen; she could not walk, eat or drink properly. Doctors told her she had a weak liver and advised her to get admitted to Hamidia hospital in the city. A resident of Jamalpura, Bhagwati has been frequently facing this problem for seven years. Breathing problem has been with me since the night the gas leaked. Now this stomach trouble has started, she said. Despite her frailty Bhagwati has twice marched to Delhi to demand the right to clean drinking water for survivors of the gas tragedy. People living around the accident site continue to suffer from diseases, from chronic ailments to abnormalities. But nobody knows the cause for sure. No one is certain how much of it is related to the gas release and how much has been exacerbated because of continuing exposure to toxins. Thats because a long-term epidemiological research has been terminated and the medical research by the state is poor and disputed. The Indian Council for Medical Research (icmr) was asked to conduct these studies right after the disaster. But in 1994 the studies were summarily discontinued. The initial reports suggested long-term and deadly health effects on the survivors. In 1989 the Madhya Pradesh governments Centre for Rehabilitation Studies, which works under the department of Gas Relief and Rehabilitation, was given this responsibility, but its studies are few and unavailable. In 2006, the P rime Ministers Office (pmo) wrote to the department of chemicals and petrochemicals (nodal for the gas disaster), asking for a long-term medical research on the gas survivors. The department wrote to icmr, asking it to consider the Rs 1.23 crore per annum proposal of the state government. icmr expressed reluctance, said the department in its note to the pmo (accessed through an rti application). The department then threw the ball back in the court of the pmo, asking it to find the money and the agency to conduct the research. At Shakir Ali doctors said ailments of the eyes and lungs are common among people who visit the hospital. We get over 50 cases of chronic obstructive pulmonary disorder (in which airways are narrowed and the condition is often irreversible) every day, said Mamta Mishra, a doctor at Shakir Ali. It is impossible for children in this part of the city to run even 100 metres without panting like a dog, said Santosh Sharma, who runs a paan shop outside Shakir Ali hospital. Behind the Union Carbide factory is Navjeevan Colony. Its resident Rajpati Bais daughter was six months old at the time of the accident. At the age of 10 she developed vertiligo (white spots) and has been losing weight ever since. She is 25 now and I cant find a match for her because of her condition, said Rajpati Bai. There is so much disease that poor people cannot afford to spend on treatment." 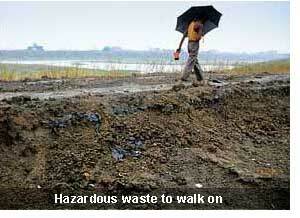 People have raised the issue of polluted water year after year but to no avail. Most people living around the factory depend on groundwater. Arif Nagar, set up in 1990, gets the municipal water on alternate days. It is hardly enough for drinking, so people have sunk 80-foot-deep borewells. The water is dark and bitter. When a fault stops supply from Kolar dam we drink this water, said Mushtaq Ali, a plumber in Arif Nagar. Mushtaqs mother Aziza Bi jokes that the nearest hospital for gas victims, Jawaharlal Nehru Hospital, is second home to her. There is nothing I havent suffered. My right foot has been numb for three years. The doctors have not been able to tell me the reason. I cannot see properly in the evening, have high blood pressure and breathing problem, she said. Aziza Bis family was moved to Arif Nagar from Bhopal Talkies where a mass burial was created in 1984. In 1994, the Supreme Court monitoring committee on hazardous waste reported groundwater contamination near the factory. The court ordered clean water be supplied to residents. It was only after two marchesfrom Bhopal to Delhi in 2006 and 2008by residents that a pipeline was laid but complaints of erratic supply persist. The state is interested in only adding more people to the list of the affected (see Relief for everyone in Bhopal). Right behind the factory is a solar evaporation pond that was used to dump the hazardous waste when the plant was operational. Its plastic lining is torn and the waste has been piled on the sides. In 2007, the state studied peoples health near the pond. It found that morbidity among people below 24 years of age was significantly higher than among the same age group in another part of Bhopal. 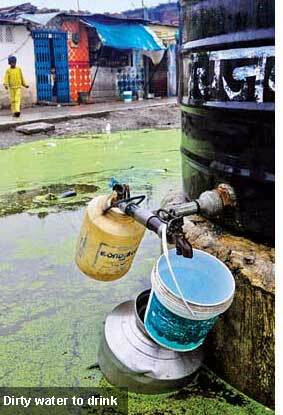 The study attributed the high incidence to poor water quality and socio-economic and environmental standards. There is no evidence to say that groundwater has become toxic due to percolation of toxics from the Union Carbide disposal area, it concluded. 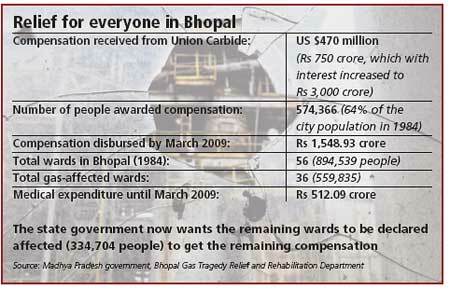 The tragedy of Bhopal is unending. The shame is ours.